GE celebrates innovators–those who are hard at work, making the world a better place. A partnership between GE and cinelan, GE FOCUS FORWARD commissioned 15 three-minute films from an impressive roster of award-winning international filmmakers. The creative brief was simple: tell a story about an innovator or a world-changing idea, and do it in about 180 seconds. 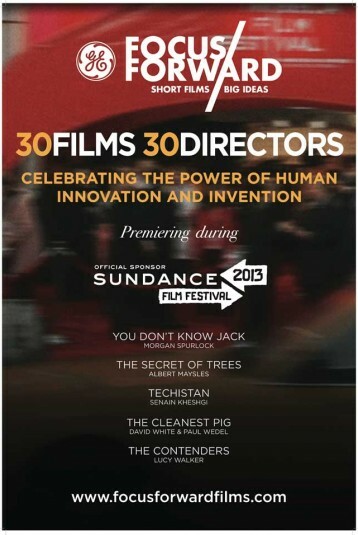 The same creative brief was offered to filmmakers everywhere during the GE FOCUS FORWARD Filmmaker Competition. Astounding entries came in from 69 countries. A jury of renowned film industry professionals selected five winners at Sundance 2013, who shared $200,000 in cash prizes, the largest ever awarded to short non-fiction films. The series has been honored by the Clio, Webby and Tribeca Disruptive Innovation Awards. The films continue to reach new audiences and receive invitations from festivals around the globe. An even greater measure of their success is the way these stories make people feel–inspired.